Today I share images of some of my Veteran People. I don’t have pictures of everyone, unfortunately, but I am deeply grateful for the service of each and every one of them. 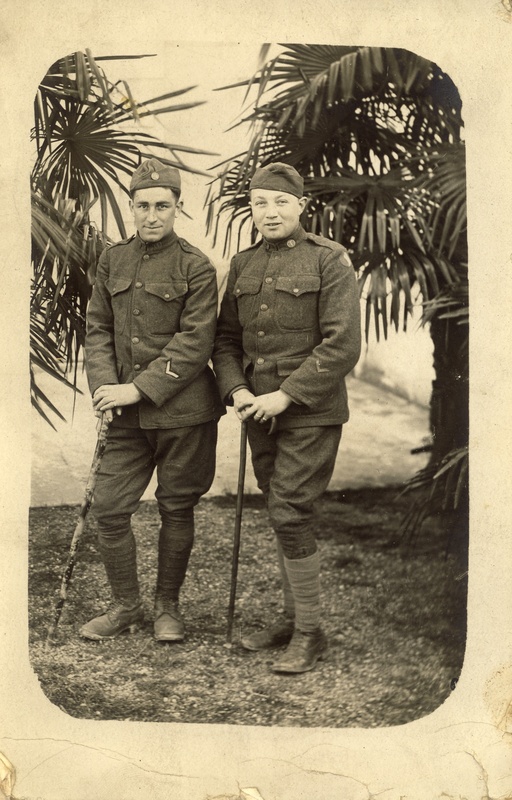 First, here is my Great-Grand-Uncle Ernst Spielmann serving in Europe during WWI. I wrote about these images in “Postcards Home from WWI“. 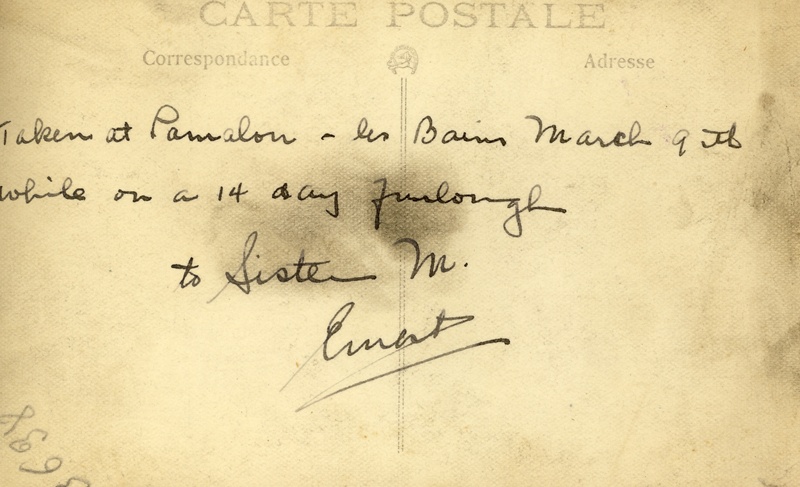 April, 1918. Ernst is seated in the middle of the front row. Photographer unknown. 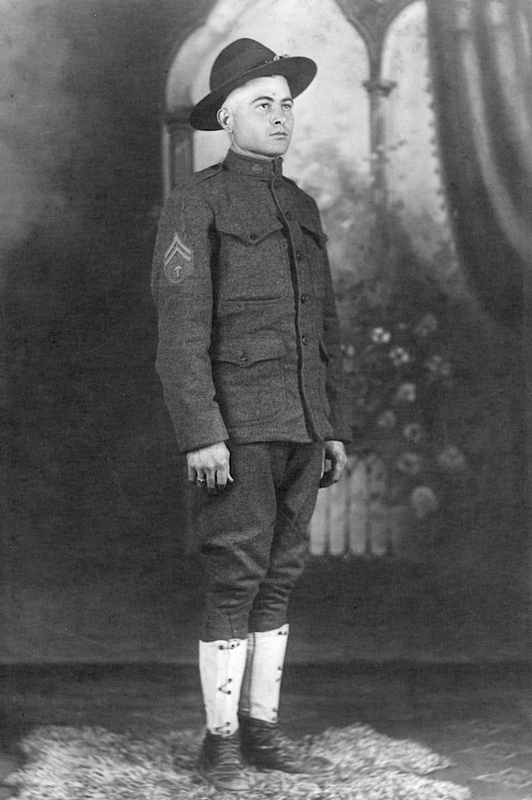 My Great-Grandfather Pete Marak also served in WWI. I don’t know much about his service history yet, but the insignia on his sleeve leads me to believe he was part of a medical unit. I cannot even imagine what he must have witnessed. My great-grandfather, Peter Paul Marak, in his WWI uniform. Date and photographer unknown. I wrote about my Great-Grandfather, Austin Flagel “Buck” Yoder, a professional jazz musician, in an earlier post. 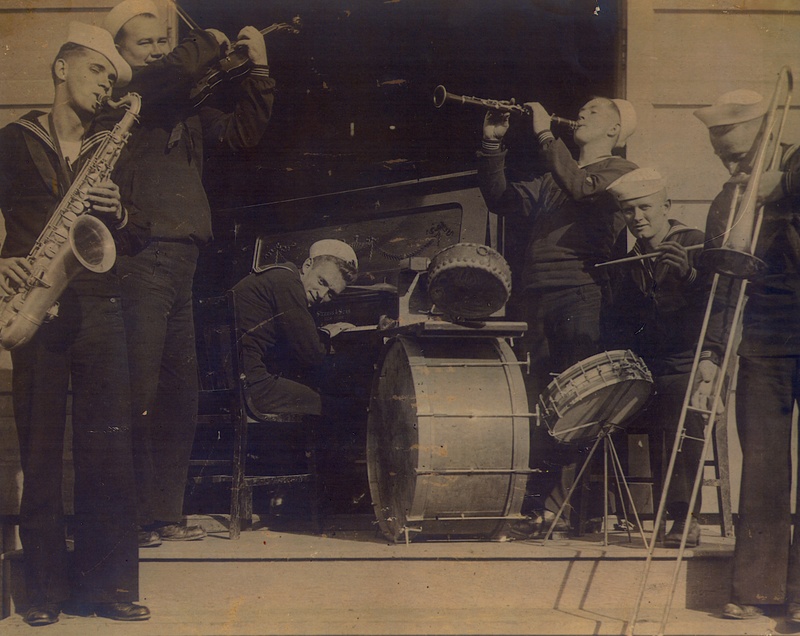 Pop joined the US Navy in WWI, enlisting as a Musician First Class out of Portland, OR. This photo was published in the Modesto Bee in January of 1968 with the following caption: “The band that started the dance band trend: from left, Lew Reynolds of Modesto, Paul Whiteman, Gene Rose, Buck Yoder, George Williamson, and John Klock.” Yes, it is that Paul Whiteman. Pop Yoder is on the clarinet. 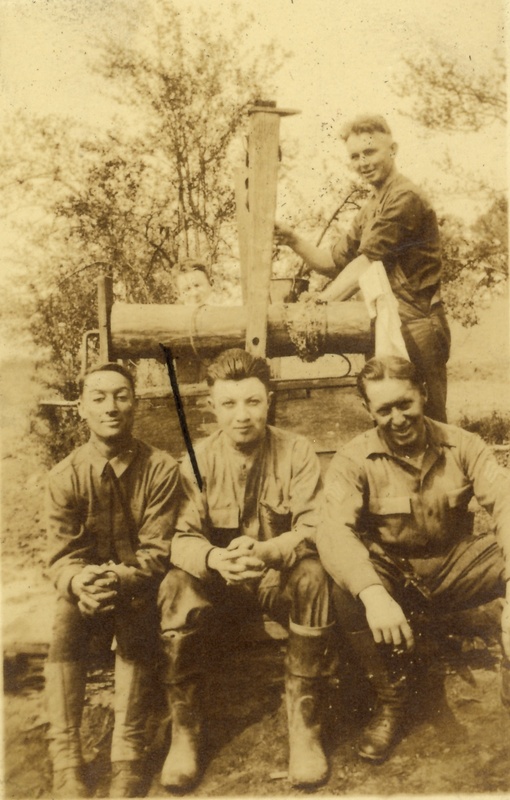 Next up is my Great-Uncle Ted Marak (son of Pete Marak, pictured above), who served in the Army Air Corps, the pre-cursor to today’s Air Force. 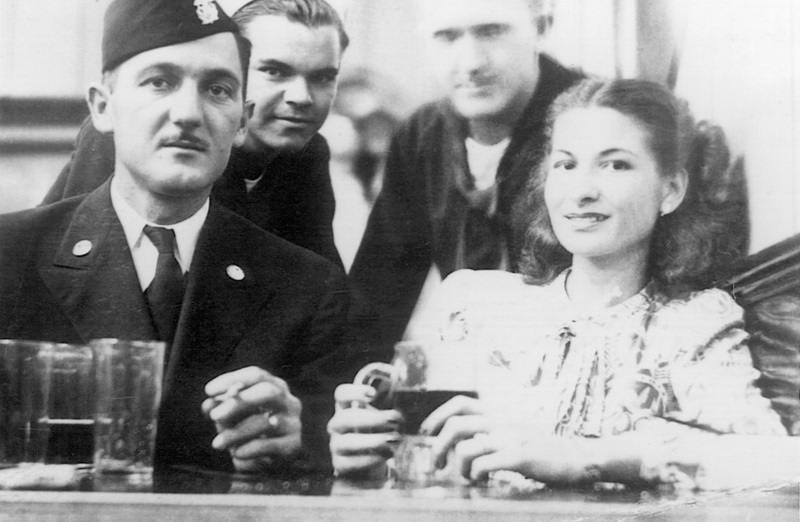 The photograph is dated November 28, 1941. 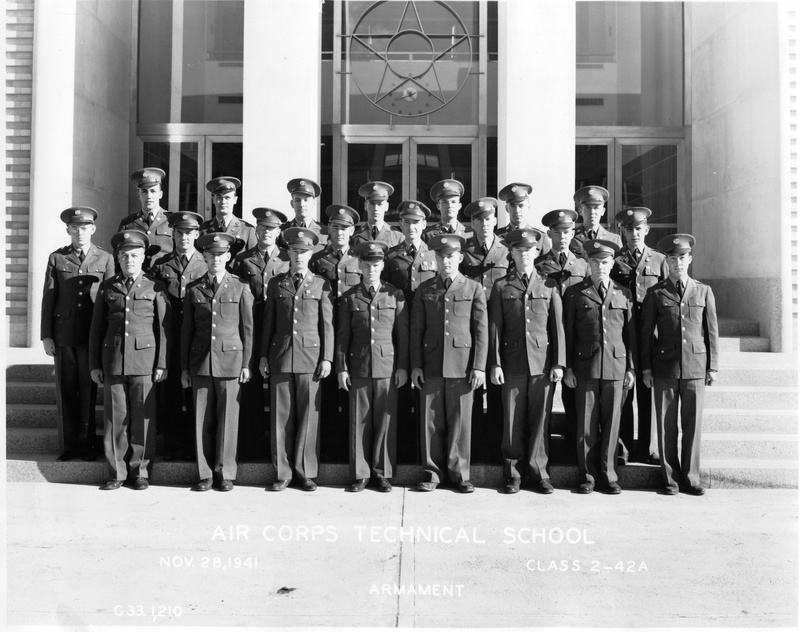 Uncle Ted is in the second row, fourth from the right. Great-Uncle Ted Marak. Isn’t he a handsome devil? He went on to lead a most extraordinary life, and will be the subject of many future posts, I promise. Here is my sweet Grandfather, Robert Lessiack, who served in the United States Marine Corps Reserves in the Pacific in WWII, eventually retiring as a Major (I think. I have many more records to dig through to get the whole story). 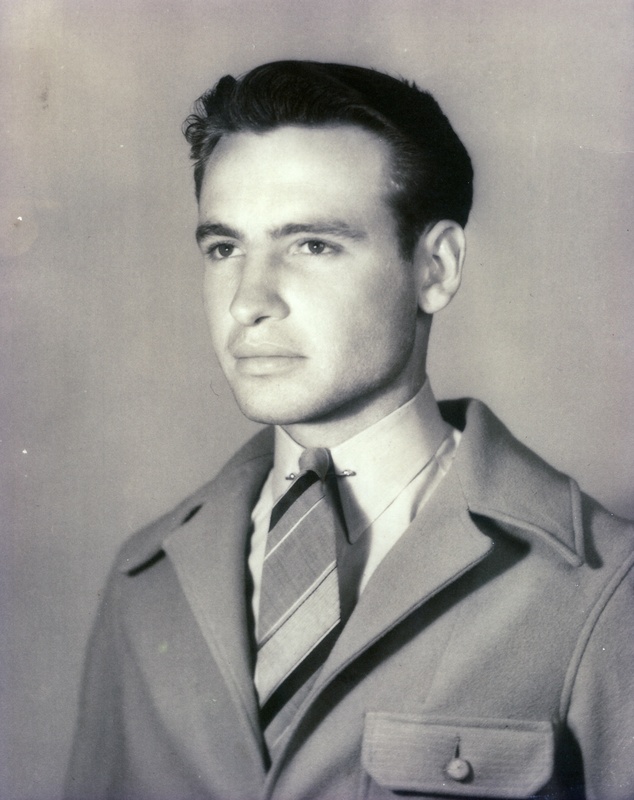 He joined up fresh out of college, and he was involved in a mysterious romance with a beautiful Navy nurse prior to meeting and marrying my grandmother in 1945. That mystery was the very first thing I wrote on this blog, and it is still one of my most frustrating brick walls. 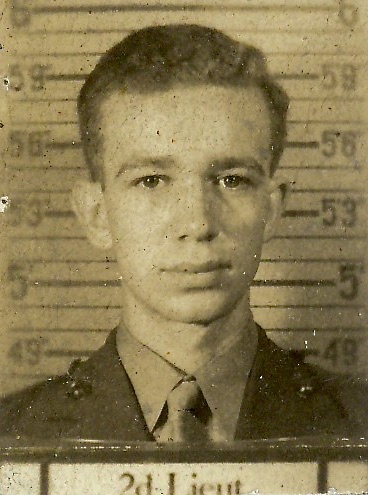 Here is Papa Bob as a fresh-faced young 2nd Lieutenant. 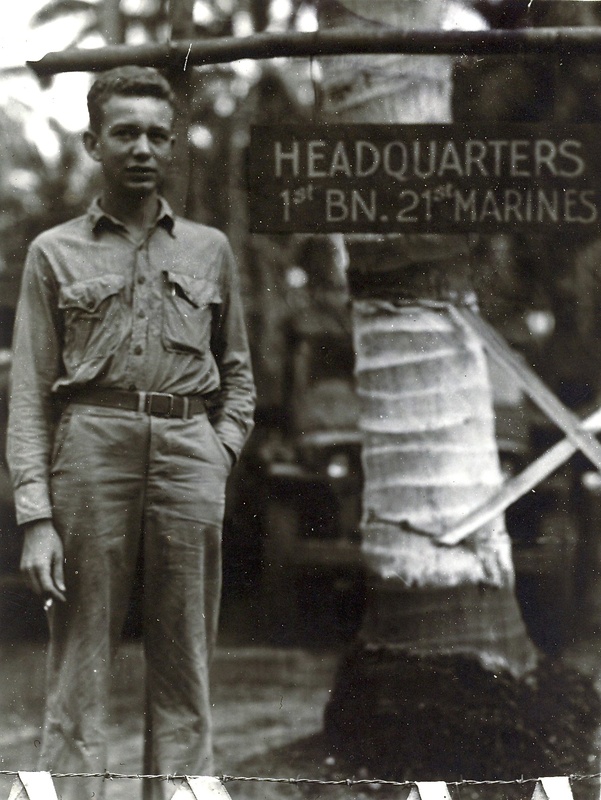 Papa Bob with the 21st Marines. Whatever happened out there, he did not want to discuss it. I did not know him to be a smoker, but perhaps it was one of the few pleasure available to him at the time. 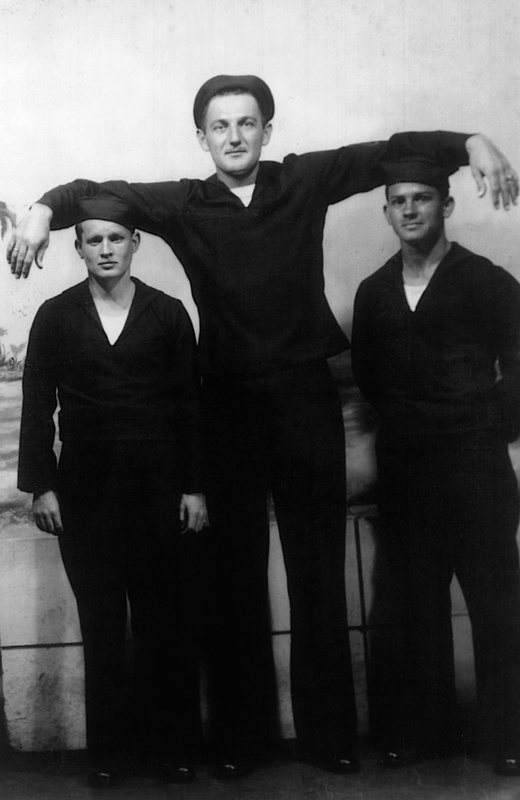 My Great-Uncle Roger Adams, an Olympic-caliber college swimmer, also served in WWII in Europe. No matter how difficult the circumstances, he was always a cheerful, sunny, make-the-best-of-it kind of fellow, so somehow this picture seems appropriate. I also wrote about Uncle Roger Sir (for that is what I always called him) here. Uncle Roger Sir Adams on hard duty in France. War is Hell, but you would not know it from this picture. Date and photographer unknown. My Pop Jim (that is, James Daniel Griffin) served in WWII as well. I believe he was in the Coast Guard, but I’m not certain. 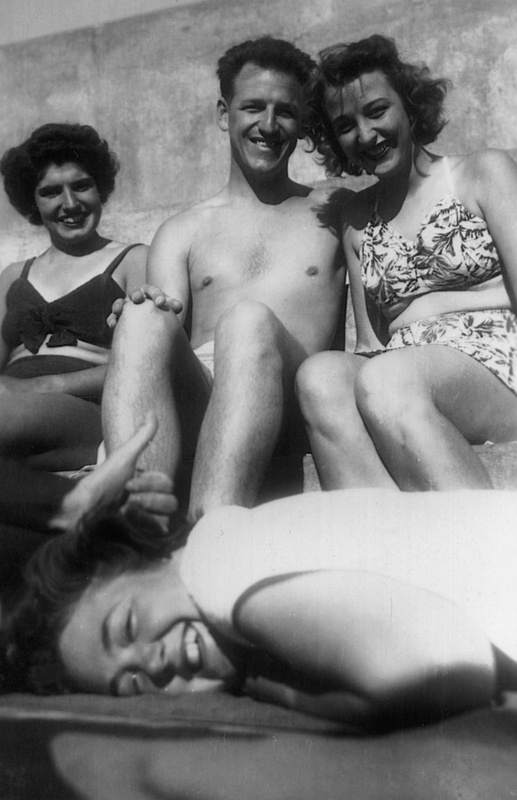 Pop Jim on the left, and my beautiful Gram Bette (who will celebrate her 90th birthday soon) on the right. They are both wearing rings, so I believe they must have already been married when this photo was taken. Date and photographer unknown. My father-in-law, Robert Robertson, had a long and distinguished career with the US Army. He served in WWII and clear through the war in Vietnam. 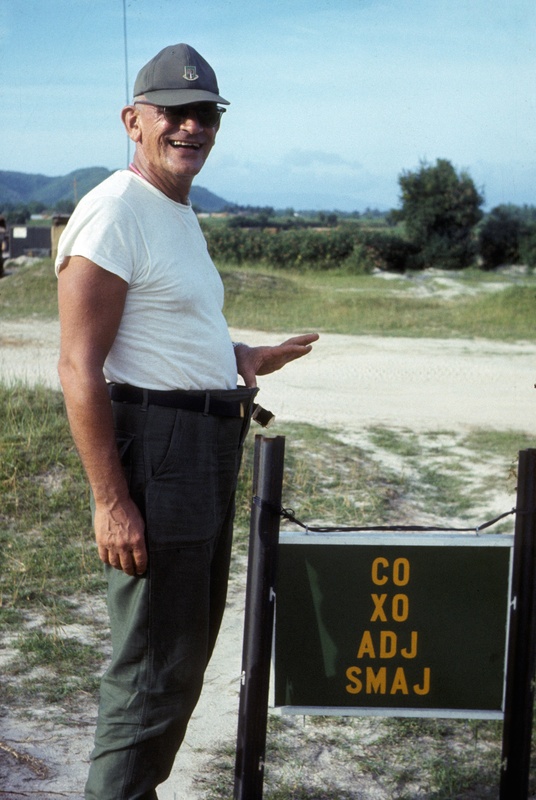 Bob was a man of great wit and writing ability; we have several priceless comedic “newsletters” that he published while in Vietnam for the entertainment of his fellow soldiers. I will share those another time — they are very fine specimens of gallows humor. My Father-in-law, Bob Robertson, with my future husband. 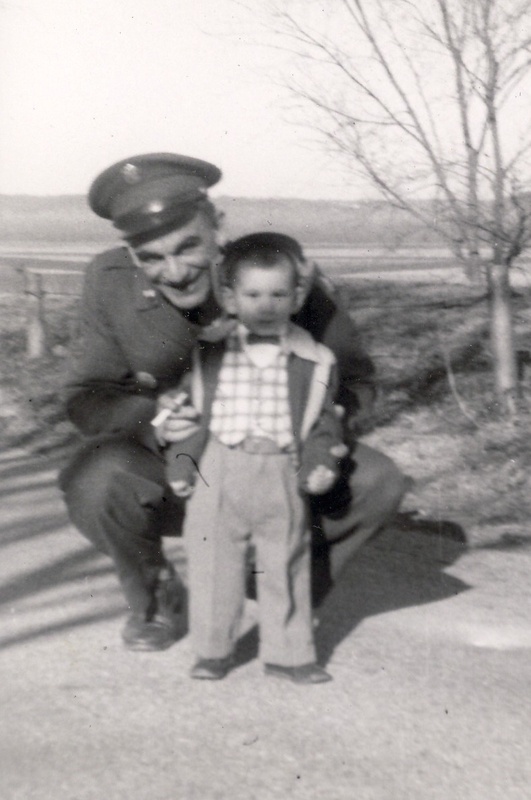 This picture was probably taken circa 1954-55, in Leavenworth, KS, where the family was stationed at the time. 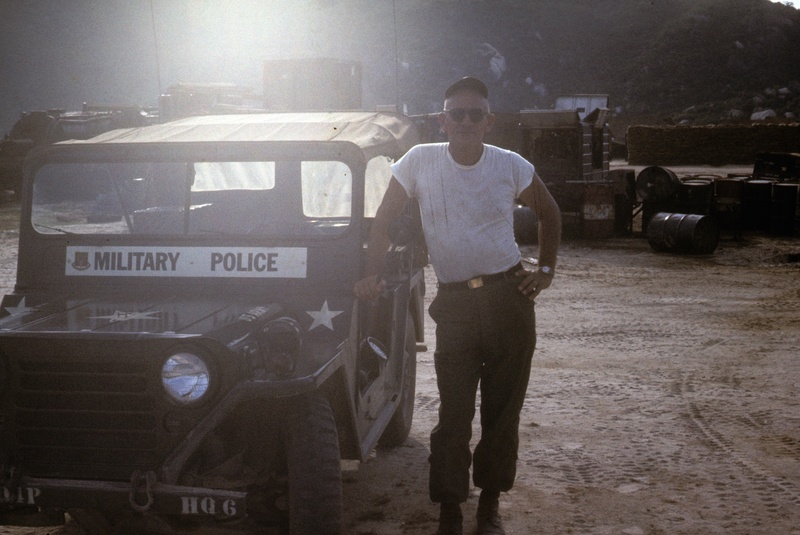 Here is Bob Robertson many years later in Vietnam. He had a long and distinguished career with the Military Police, eventually retiring as a Seargent Major. I guess the food wasn’t very good? 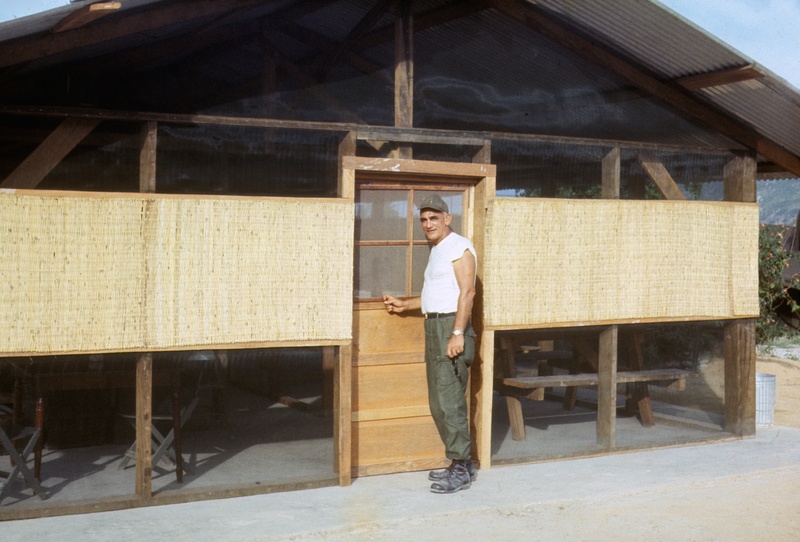 Bob Robertson’s quarters in Vietnam, or maybe it’s the mess hall. Thank you, my Veteran People, for all you did and do. That is quite an amazing lineup of veterans in your family. Wonderful photographs as well. It seems your family was fortunate, and none of these men died in the line of duty. Thanks for sharing. Yes–very, very fortunate in that regard. I was thinking about that as I wrote this piece. This entry was posted on November 10, 2014 by Pancho in Asides and tagged Buck Yoder, Ernst Spielmann, Jim Griffin, Pete Marak, Robert Lessiack, Robert Robertson, Roger W Adams, Ted Marak, Veterans Day, WWI. If you are a Person of Pancho, have questions, clues, or want to use any images or writing from this blog, kindly contact me at peopleofpancho@gmail.com. I would love to hear from you. © The People of Pancho, 2013-2018. 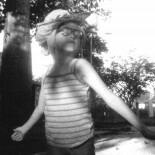 Unauthorized use and/or duplication of photographs or writing without express and written permission from this blog’s author and/or owner is strictly prohibited. Excerpts and links may be used, provided that full and clear credit is given to The People of Pancho blog with appropriate and specific direction to the original content. All content provided on this site is for informational purposes only. The People of Pancho makes no representations as to accuracy, completeness, currentness, suitability, or validity of any information on this site and will not be liable for any errors or omissions in this information or any losses, injuries, or damages arising from its display or use. All information is provided on an as-is basis.